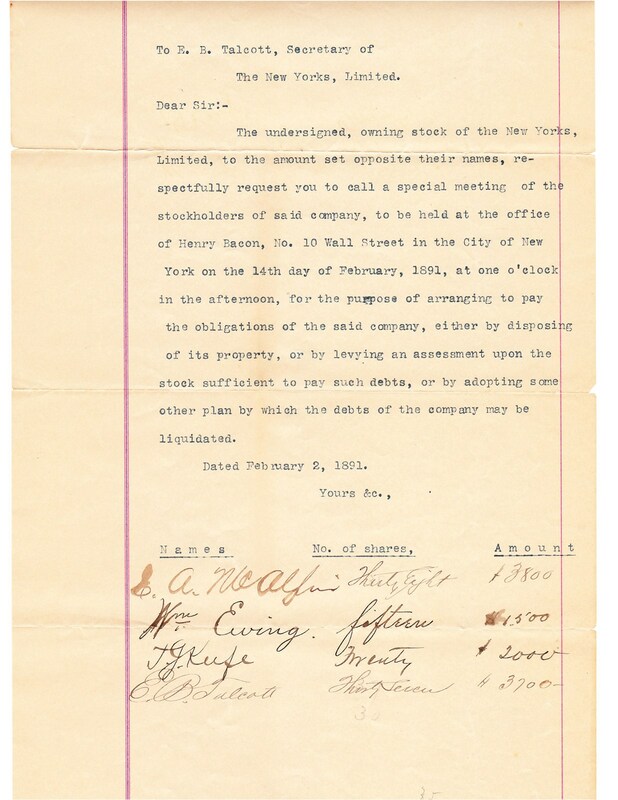 There are virtually no words that can properly describe this most extraordinary one-page document that miraculously includes the ultra-rare signatures of BOTH Tim Keefe and Buck Ewing! Unfathomable to say the least, it literally defies logic that a single document can reflect both of these near-impossible scripts. World-class autograph enthusiasts surely know that obtaining either a Tim Keefe or Buck Ewing is a near-impossible task, with only a handful of these hallowed scripts previously documented before this incredible Players' League find. True, this discovery has unearthed several autographs of Hall of Famers Keefe and Ewing with two separate Keefe's and a single Ewing also presented in this auction. However, the likelihood of finding a document that includes BOTH of these immortal Cooperstown inductees is unfeasible, with its sheer existence exponentially scarcer than a single scripted document. 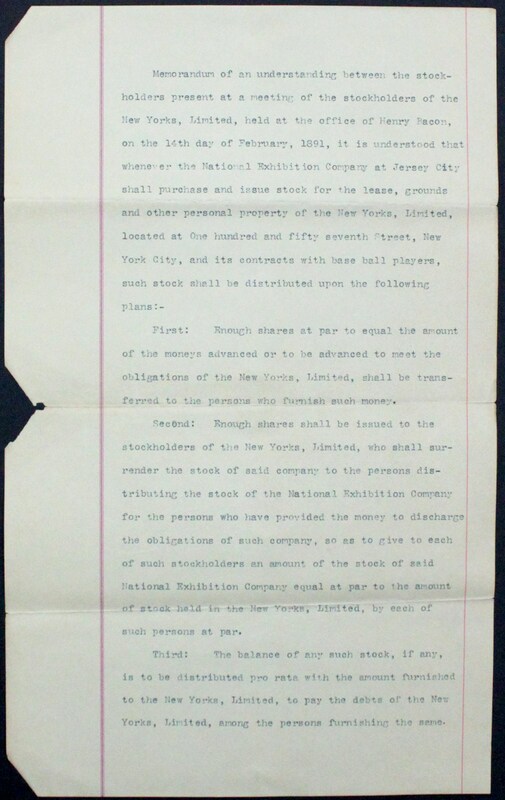 Courtesy of Memory Lane, this remarkable Stockholder page relating to stock shares retained by several parties in the Limited organization indeed includes "T.J. Keefe" and "Wm. Ewing" signatures that have been bolded scripted in black fountain pen (portraying solid "8/9" strength). While three modest mailing folds are evident along with a few negligible edge tears, the document remains in surprisingly nice condition, depicting fine overall aesthetics for a 127-year old relic. 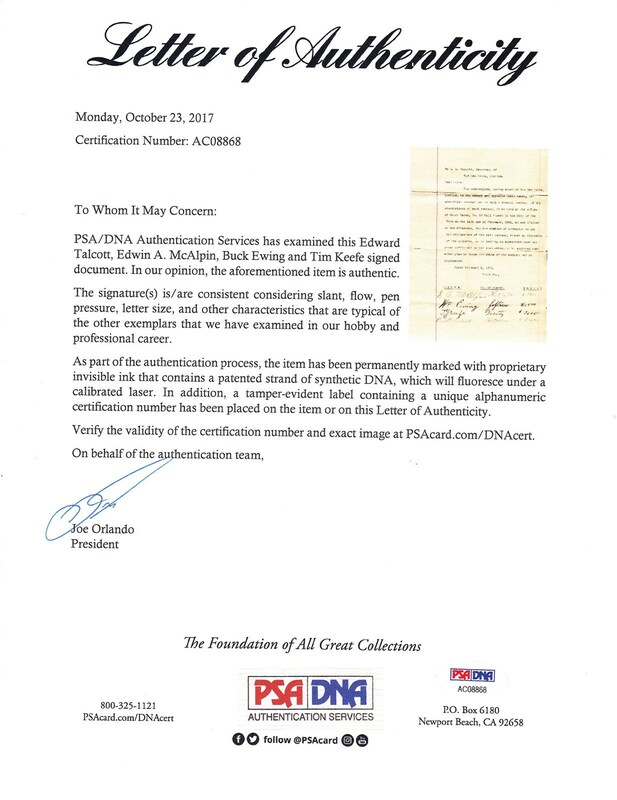 Authenticated by PSA, a full LOA has been included, and we can honestly say that this unparalleled offering now stands as one of the most formidable and signed documents in the hobby with a paucity level unrivaled by nearly any other existing autograph! The storied careers of Keefe and Ewing ironically coincide, with their first professional team being the Troy Haymakers in 1880. Both players would eventually find themselves as teammates on the New York Gothams/Giants as well as both residing as the arguable finest players of their time at their respective positions. Keefe would compile an amazing 342 lifetime victories that place him 10th on the all-time win list, posting 40 or more wins in two separate seasons and compiling a sensational 2.63 lifetime E.R.A. William 'Buck" Ewing posted a .303 lifetime batting average and was widely considered the greatest of all 19th century catchers. While catching was his primary position, he demonstrated his remarkable versatility and athleticism by also playing all four infield positions, outfield and even pitcher. Along with Anson, Nichols, Clarkson, Galvin, Kelly, Ward and Delahanty (just to mention a few 19th century stars), Keefe and Ewing stand as two of the greatest 19th century baseball players, justifying why the globe's most advanced autograph collectors painstakingly pursue their near-impossible signatures. 1. General Edwin Augustus McAlpin - President of the Players' League and the largest shareholder of the Limited (38/200 of the issued shares). McAlpin was a wealthy tobacco manufacturer who built the Hotel McAlpin in New York City, at the time the largest hotel in the world. 4. 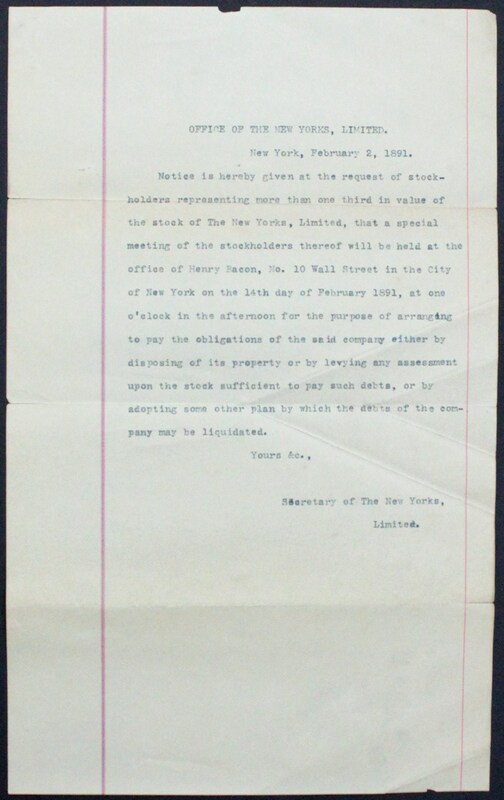 Edward B Talcott -Vice-President of the Limited. Talcott was a wealthy stockbroker, and his share of the Limited was almost as large as McAlpin's (37/200 of the issued shares). 1. All advances to meet the Limited's outstanding bills would be covered by shares issued at par. 2. Any Limited stock held would be swapped for National Exhibition Company stock on a par for par basis. Along with the aforementioned "Wm. Ewing" and "T.J. Keefe" signatures, both the "E.A. McAlpin" and "E.B. 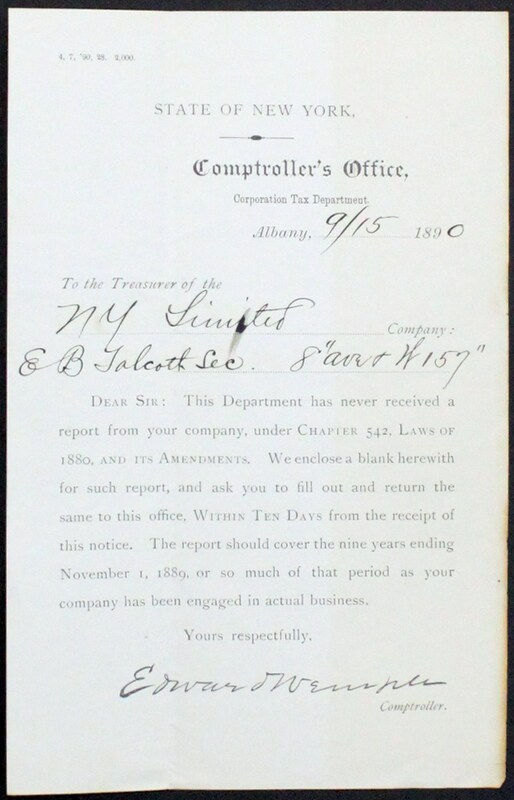 Talcott autographs are likewise bold and legible, with all four individuals scripting the number of respective shares and dollar amounts in their own handwriting. Yet, unquestionably, it is the Keefe and Ewing autographs that place this offering at a pinnacle level, and we simply cannot overemphasize the unparalleled significance of a document signed by both of these Hall of Fame legends. As previously stated, finding "individual" scripts of these players is an excruciatingly painful and near-impossible endeavor, let alone discovering a document that miraculously depicts both of their sanctified signatures. We can only begin to imagine how the most esteemed autograph collectors are salivating over the possibility of making this museum worthy masterpiece their own; and regarding its infinite-like potential value we will defer to you, the sophisticated enthusiast, to ultimately determine its true worth!